Oil sands extraction is booming in the province of Alberta. Much of the province’s oil sands resource, however, lies in the province’s northeast–territory that the boreal woodland caribou depends on for survival. Environment Canada recently released a recovery strategy for boreal woodland caribou, which are designated as “threatened” under the Canadian Species at Risk Act­­­­. Human activity that modifies boreal woodland caribou habitat—such as forestry and oil and gas development, as well as recreation—seems to be a key driver in their declining numbers. Currently, industry spends millions of dollars annually to reduce the effects of development on caribou populations. Notwithstanding this investment, as oil and gas development continues in the region, a key question remains: will future in-situ  oil sands development have a significant impact on caribou movement across the landscape? It is precisely this question that Dr. Tyler Muhly and Dr. 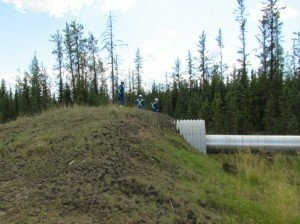 Rob Serrouya investigate in their latest report through the Ecological Monitoring Committee for the Lower Athabasca’s (EMCLA)  Caribou project. The report, entitled “Assessing the Influence of in situ Industrial Development on Caribou (Rangifer tarandus) Movement in the Lower Athabasca Planning Region of Alberta,” summarizes the methods and results from a one-year study focussed on in-situ developments and their effects on caribou movement. 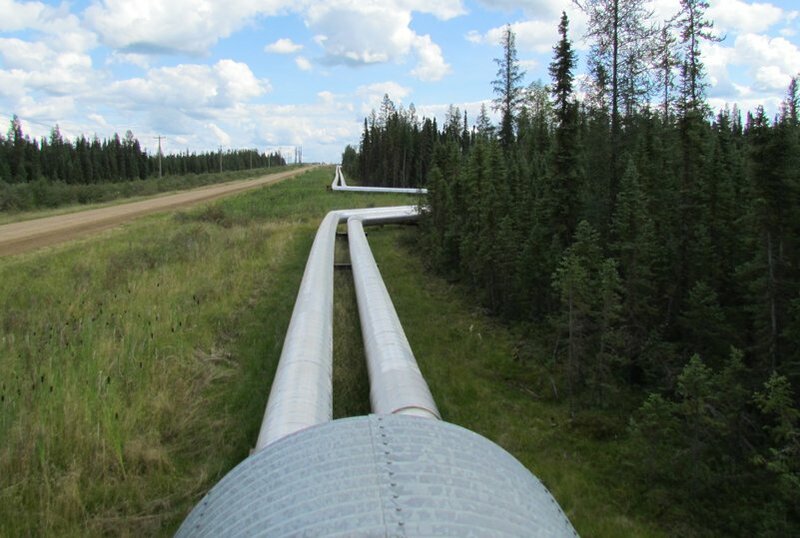 In-situ extraction requires a network of aboveground pipelines (AGPs) to transport steam from a central processing facility (CPF) to each oil sands well, as well as bitumen back from each well to the CPF. AGPs consist of one to five 34 cm to 50 cm diameter pipelines bundled together on support racks (see picture above). “There’s regulatory concern that future high densities of AGPs in the oil sands region will block caribou movement, restricting their ability to access resources and escape predators, ultimately resulting in greater mortality”, says Muhly. As a result of this concern, AGP crossing structures, which allow wildlife including caribou to travel unimpeded across AGPs are mandated to ensure caribou can move freely. The addition of crossing structures makes AGPs more permeable or passable. To test how future in-situ developments will affect caribou movement, Muhly and his team ran a series of simulations. Although AGPs currently occur at relatively low densities, the density of this infrastructure is expected to increase rapidly. To begin, Muhly forecast the level of AGP development expected in 50 years for an area around Christina Lake, Alberta. Then, he simulated the impact of this development on caribou movement based on known caribou behaviour from GPS collars. The effects of the future development on caribou movements were tested under several different scenarios. “We varied the caribou crossing rate [the ease with which caribou can cross AGPs] of AGPs and spacing between in-situ developments, as well as whether a protected area was designated in the range or not,” explains Muhly. In total, simulations for 25 caribou in response to various landscape scenarios were run to determine caribou home range sizes and movement rates. The conclusion? Future in-situ oil sands development may indeed affect caribou movement. Crossing rates had the greatest effect on caribou home range sizes, whereas protected areas had relatively minimal effect and development spacing had no effect. The next phase of the Caribou Project involves comparing the expected caribou crossing rate generated from the simulated caribou movement patterns to actual crossing rates measured by camera traps currently installed at existing crossing structures. “With this information,” adds Muhly, “we can test whether current AGP infrastructure is sufficiently “crossable” to allow caribou to cross AGPs at a rate greater than 25%, thus allowing this iconic species to maintain their movement in northeast Alberta.” Stay tuned for updated results on this comparison! In-situ extraction is used to extract the majority of bitumen deposits that are located deep (>75 m) underground. The term in-situ literally means the bitumen is recovered “in place” as it is heated and pumped to the surface. The EMCLA is a consortium of oil sands companies, government ministries and agencies coordinated by the ABMI that oversees the design, implementation, and management of specific monitoring programs for the Lower Athabasca Planning Region.